Where to get your fright on this Halloween. The little hairs rise on the back of your neck. Your senses are heightened. What was that noise? Is someone watching you? Oh, we do love a good fright. If you do too, then this list is for you. Here’s a smattering of the frightful fun you can find in Bangor and beyond this October. After 18 years, the annual Fright at the Fort Halloween experience at Fort Knox State Park in Prospect is, for our money, the scariest haunted “house” in Maine. But it’s definitely not for the faint of heart — Fort Knox is a pretty creepy place to begin with, and when you fill it with legions of gleefully sadistic volunteer spooks … well, it gets pretty tense. In the best scary way possible, of course. This year’s Fright nights are set for 5:30 to 9 p.m. on Saturday, Oct. 14, Friday and Saturday, Oct. 20 and 21, and Friday and Saturday, Oct. 27 and 28. Tickets are $10 for adults and $5 for kids 12 and under. But it’s really not for the little ones — it’s likely too scary for them. An “express” ticket ($13 adults, $7 kids) helps you skip the line and can be bought online at fortknox.maineguide.com/Fright. Not only has 2017 been a banner year for Stephen King movies — with the releases of “The Dark Tower” and “IT,” just to name a few — but in the Bangor area, theatrical adaptations of King works are running all throughout the month of October. Penobscot Theatre Company opens its production of “Misery,” William Goldman’s adaptation of King’s dark thriller about a writer held captive by his “number one fan.” It’s set for Wednesdays through Sundays, Oct. 12 through Nov. 5 at the Bangor Opera House. And up in Orono, Some Theatre Company will stage “Carrie: The Musical,” a musical adaptation of King’s classic story of a telekinetic teen pushed to the breaking point — the bloody musical was a Broadway flop when it premiered 1988, but has since attained cult favorite status. The show opens on Halloween, October 31, at the Keith Anderson Community Center in Orono. Additional shows will be staged from Nov. 3-5 and Nov. 10-12. The Bangor Historical Society’s Ghostly Bangor Walking Tour feature tales veiled in unsolved mysteries, murder and the past residents who may still linger in the Queen City. Tours stroll through the streets of Downtown Bangor and last between 60 and 90 minutes, departing from the Thomas A. Hill House on Union Street. They’re set for Saturdays on Oct. 1, 8, 15, 22, 29, Tuesdays on Oct. 11, 18, 25, and Thursdays Oct. 13 and 27. Admission is $10 per person. The seventh annual Bangor Zombie Walk is set for Saturday, Oct. 28. What’s a zombie walk? Well, it’s actually pretty simple: don your best zombie outfit, meet at the Bangor Waterfront at 3 p.m. (you’ll know the spot by the hordes of zombies), and get ready to shuffle and moan your way through town. Some people go over the top with their zombie makeup and costumes; others simply rub a little green or gray face paint on, rip up a t-shirt and just join in the all-ages fun. A suggested donation of $5 goes to benefit a number of local charities. 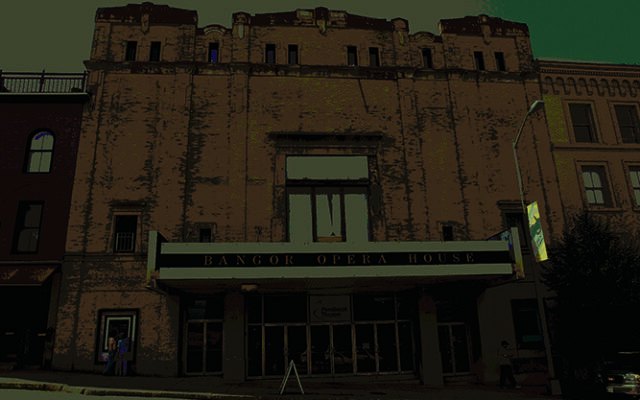 For more information, like Bangor Zombie Walk on Facebook. This homegrown, hand-built haunted house takes its job of scaring the bejeezus out of you very seriously — it routinely attracts over 2,000 people over the course of the weekend, with community members donning truly terrifying costumes, ready to grab attendees with no warning. It’s not recommended for kids 12 and under, though parents can use discretion. This year’s event is set for Oct. 27 and 28, from 7 p.m. to midnight. At just $5, it’s a steal, with all the proceeds benefiting sports programs in Kenduskeag. For more information, like the Kenduskeag Haunted House on Facebook.